Only a few years ago the idea that the universe was full of invisible matter seemed highly speculative, and ideas of dark energy looked to be on the fringe of science. It came as rather a surprise to me when it was announced that the percentages of normal matter, dark matter and dark energy had been found fairly precisely. This book looks at the recent discoveries in this area, which Seife calls the third cosmological revolution. The first few chapters set the scene, with early myths being overthrown by the first cosmological revolution, which started with the work of Copernicus, Kepler, and Brahe, and culminated in the struggles of Galileo with the Catholic Church in establishing the motion of the Earth rather than the Sun. The second cosmological revolution started in the first decades of the 20th century, with the work of Einstein developing the equations of general relativity which described the nature and evolution of the cosmos. Because he wanted a static universe, Einstein was forced to add a fudge factor to the equations, the cosmological constant Λ. 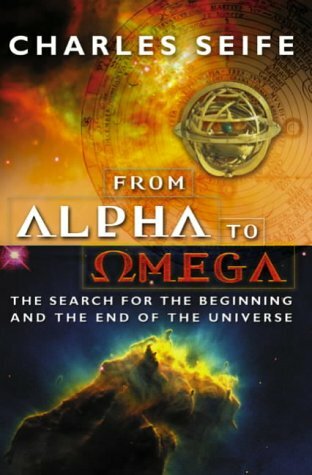 Now the title of this book is Alpha and Omega, since it relates to matters concerning the beginning and end of the universe. However, the Greek letters the book is really about are the cosmological constant Λ and the density of the universe Ω. Einstein called the cosmological constant his biggest blunder when the universe was actually found to be expanding. The discovery of the cosmic microwave background radiation in the 1960's was a highly significant point in cosmology, but fitted in with the idea of a universe which exploded in a big bang and then would expand forever, since the density seemed fall far short of the critical density needed to stop the expansion. The density of the universe Ω is given in terms of this critical density and the amount of visible matter was about 0.5% of this value. Seife's third cosmological revolution started in the 1990's when experiments began to show that there might be more to the universe than meets the eye. Studies of the recession of distant supernovae implied that maybe the cosmological constant Λ should be reintroduced. Furthermore the variation in the cosmic background radiation indicated that the universe was actually flat – indicating that Ω has a value of unity. He goes on to investigate where the missing mass of the universe could be. The fusion of hydrogen in the early universe into heavier elements depended on the density of matter, and from the observed proportions of different elements it can be deduced that normal (i.e. baryonic) matter makes up about 5% of Ω. The non-uniformity of the universe gives a handle on the total amount of matter in the universe, and experiments have shown this to be about 35%. Thus there is 4.5% of normal but invisible matter, and 30% of some form of exotic matter. Seife goes on to examine what form these might take. Neutrinos are looked at but only provide a contribution of 0.5%. There is a chapter on supersymmetry, another possibility for exotic particles. Think of a piston in a sealed container – you have to do work to pull it out, and one thinks of the vacuum as pulling it in, but really it's the external air pressure which is pushing – if it were in outer space wouldn't have to do any work. However, if vacuum has energy, you would have to do work, to supply the energy to create more vacuum. Thus a vacuum with energy can be thought of as having a negative pressure. Now you might think that this would pull things together, but wait... Einstein's equations of general relativity say that pressure has a gravitational effect, and so negative pressure gives negative gravity. This is what powered inflation, and is why dark energy leads to the acceleration of the expansion of the universe. Seife then goes on to consider the remaining 65% of Ω. It is thought that this could be due to vacuum energy, which would generate a repulsive effect i.e. a cosmological constant Λ. I feel he doesn't really do justice to this, implying that the energy pushes outwards directly. In fact things are not so intuitive – in fact the related Casimir effect creates an attractive force. The book concludes with a look into the future, both the long term future of the universe, and the possibilities in the study of cosmology after the third cosmological revolution. There are several appendices. The fourth is particularly useful – it lists ongoing experiments in this area to keep a watch on. The only points I would criticise in this book are the one about vacuum energy mentioned above, and treatment of work between the end of the second cosmological revolution and the start of the third. This has to be referred to in discussing the latest work, but the lack of chronological order can be confusing. In conclusion, this is a highly readable book, and is aimed at a non-technical audience. However, there is so much information on the latest experiments that even those knowledgeable in the subject are likely to find something new.